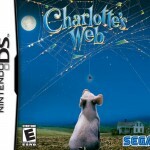 “Charlotte’s Web: Wilbur and Friends” is a series of activity-based games meshed together by the retelling of the movie’s story through movie still pictures.Gossamer threads from the movie version of “Charlotte’s Web” have been woven into games that can be played on the PC, Nintendo DS and Nintendo Game Boy Advance. Families wanting to explore the world of Wilbur, Charlotte and Fern have two options: “Charlotte’s Web: Wilbur and Friends” for the PC and “Charlotte’s Web” for the DS and Game Boy Advance. Here is a closer look at the PC version. “Charlotte’s Web: Wilbur and Friends” is a well-done movie tie-in game because its 10 games are mentally challenging and different. For those looking for a more traditional action platform game, turn to “Charlotte’s Web” for the DS and Game Boy Advance — they are good as well.